A large, distinctive, and predatory sea creature, the swordfish is an ocean dweller of impressive size and appearance. Their scientific name, Xiphias gladius, comes from the words for ‘sword’ in Greek and Latin, which describes them perfectly as these fish have a long, flat bill that looks very much like a long blade. They are also known as broadbills in some countries, and though they look similar to other fish like the marlin, with a comparable sleek and rounded body type, they’re actually the only members of the Xiphiidae family. Swordfish generally inhabit temperate and tropical parts of the Atlantic, Pacific and Indian oceans, since they prefer water temperatures between 18 and 22 degrees Celsius. But they can tolerate more extreme conditions as well, having been found in water as warm as 27 degrees and as cold as 5 degrees Celsius. They are one of the migratory fish species (although not schooling fish), following prey to colder waters in the summertime. Swordfish can grow to be quite sizable. The largest recorded measurements are 14.9 feet in length and 1,430 lb in weight, while generally they tend to be around almost 10 feet on average. Interestingly, female swordfish tend to be larger than the males, although they have the same appearance otherwise. Pacific swordfish reach a greater size, on average, than their relatives living in the northwest Atlantic or Mediterranean. Swordfish will swim close to the surface at times, but can also be found swimming as deep as 1800 feet deep underwater. As for their lifespan, the maximum average age is believed to be at least 9 years, but the process of aging swordfish can be difficult. Like most fish, swordfish are ectothermic (cold-blooded), but, like a rare few other species of fish (tuna and some sharks, for instance) they have organs next to their eyes that actually heat their eyes and brains, improving their vision and therefore their ability to catch prey. There are some other distinguishing characteristics that are unique to swordfish as well. Unlike other sea creatures, these fish actually lose all of their teeth and scales by the time they’re adults, and they’ve been seen to bask at the surface of the water, sometimes even jumping out of the water entirely – a behavior called breaching. They have a large primary dorsal fin, and a smaller secondary dorsal fin close to their tail. Swordfish have been found to host over 50 different types of parasites – in fact, some parasitic larvae may even be able to be identified genetically and used as a ‘marker’ to determine where a swordfish originated from. Mostly seeking prey at night, swordfish tend to be speedy, agile and efficient hunters that aren’t particularly picky when it comes to what they eat. Mackerel, hake, rockfish, herring, squid and even crustaceans have all been included on swordfish menus. These fantastic fish don’t actually use their bill to ‘spear’ their food, like many people believe. Instead, they slash at larger prey with their bill to stun and dismember it, while smaller food tends to be swallowed whole. As larger predators, swordfish don’t have very many enemies of their own, although killer whales and mako sharks have been known to take on a risky swordfish meal from time to time. 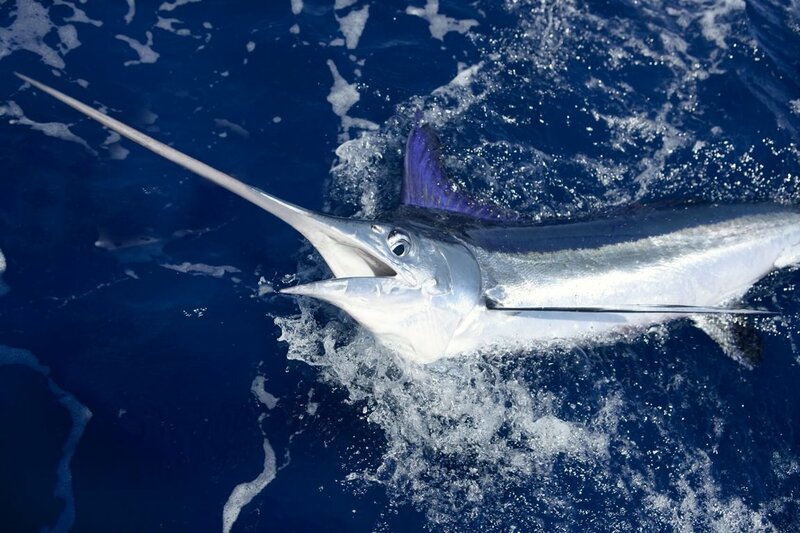 Spring and summer are prime breeding seasons in the North Pacific for these fish; though November to February is the spawning season for South Atlantic swordfish and breeding takes place year-round for swordfish living near the equator. Some of the most well-known spawning grounds for swordfish are in the Mediterranean, however, just south of Italy and Sicily large numbers of eggs and young swordfish have been recorded. Warmer temperatures are preferred for spawning, so seasons usually correspond with water temperatures that remain at 20 degrees Celsius or above. To reproduce, females release a huge number of buoyant eggs (anywhere from 1 to 29 million) into the water, where they are fertilized by clouds of sperm from the male swordfish. For such a large fish, the newly hatched larvae are tiny, measuring only 4mm long. They’re also born with a short snout, which only starts to lengthen into the beginnings of a future sword-like bill as they approach 1cm in length. In the first year swordfish can grow so quickly that they can reach a length of up to 90cm (almost 1m). Humans and human activity are currently the biggest threats to swordfish populations. The size and speed of these large fish make them a challenging and popular target for sport fishermen, although they’re also caught for commercial consumption. Swordfish is a popular menu item at restaurants worldwide because of its firm, white, meat, but tends to contain high levels of mercury. Although Atlantic populations have been protected by regulations and efforts have been successful to restore swordfish numbers there, Mediterranean swordfish are at higher risk because of illegal driftnet fisheries which kill a large number of marine life species. Greenpeace International has also added the swordfish to its seafood ‘red list’.